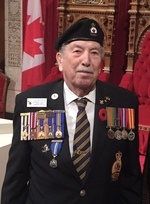 Surrounded by loving family at his residence at The Perley and Rideau Veterans’ Health Centre on March 26, 2019 at the age of 95. Loving husband of the late Phyllis. Devoted father of Deborah McLachlan (late Ernie Mahoney) and Janet Purcell (Jon). Proud grandfather to Devon (Eleini Bleeker) and Julianne Purcell (Peter Woyzbun). A special thank you to the caring staff at The Perley and Rideau Veterans’ Health Centre. Friends are invited to visit at the Central Chapel of Hulse, Playfair & McGarry, 315 McLeod Street (at O'Connor) on Friday April 5, 2019 from 6-8pm and Saturday April 6, 2019 from 1-3pm. A Memorial service will be held at 3pm. Reception to follow.